Your flashbulb memories of Half-Life games. We normally associate flashbulb memories with incredibly sociological events and I in no way want to belittle these types of events or their consequences by comparing our mini-memories of videos games to these events. That said, for some these memories have significant importance as they changed the way we live our lives. My life would certainly be very different if I hadn’t bought that computer magazine. But this article is not about how we got into gaming or even our favourite moments of the games but more the moment we first heard about or became aware of any Half-Life game. For me Half-Life doesn’t have a flashbulb memory associated with it. It more or less seeped into my awareness. I was hooked on Unreal and knew there was another similar FPS game around. I just didn’t want to lose that love of Unreal. I saw the orange, Green and Blue boxes in PC World but didn’t look or touch them. I came to the Half-Life party late, but maybe you didn’t Do you remember where you were when you first heard of Half-Life? Now, Half-Life 2 is completely different. Whilst I don’t remember where I was or any other details I do remember the moment when I first saw the crowbar with the shadow that looked like a “2”. I don’t know if this was an official Valve promo image or whether a gaming magazine created it after getting a press release, but I do remember feeling quite excited. I can’t say the same for Ep1 or Ep2 but I am pretty sure we will all have a mini-flashbulb memory when we finally hear about HL3/Ep3 or whatever they call it. So, sit back on the couch, relax and tell me all about your Half-Life flashbulb memories…..
My earliest memory of Half Life came with my second PC. A massively powerful “Dell XPS T550” I bought in July 1999 for a hefty £2278.33; which I bought mainly for my 3D modelling hobby. I heard about this Half Life game in the gamer mags I often bought during my lunch breaks and as it was the latest game I bought it to see how good my new PC was. At the time my most used games machine was still my old trusty “Commodore 64” but HL changed that! And the “PC Gamer – game of the month” logo for December 1998 giving it a 96% rating! How my old “Gateway 2000 PS-200 XL” must have groaned when I played Half —Life on it as I awaited my new machine. After all this was a 1996 PC but it was top of the line new and met the games recommended specs to a point! So my overriding memories of “Half-Life” are of excitement, anguish and frustration, (the joy of playing on an outdated machine) and elation as it truly rocked on my new PC! It just felt epic, from the now famous hazard course to the momentous donning of that orange HEV suit and the first swing of the most famous crowbar ever! “Half-Life 2” was really the same sort of memory, but now the Internet was making its mark on my psyche. But the shock was to come when I installed this new game and I first entered the realm of “Steam”. It took a day to install HL2 on my PC with my dial-up modulator/demodulator, (modem), a whole day; that’s just insane! And from what I had read online there were more than a few that were cursing the day they had unleashed steam in their lives! One man said he was the proud owner of an expensive silver disc with a hole in it! Was I the lucky one? I have only had one hiccup with steam, but it was minor and it gave me HL2 and that is magic. It seems that Half-Life has always considered, or maybe hastened my acquisition of a new PC. I find it hard to imagine PC gaming without Half-Life. I have games sill sealed in their wrappers because to play anything FPS not HL seems too weird! Not long after purchasing HL2-episode 1 I discovered the most amazing software offer in the history of gaming, the famous “The Orange Box”! Containing HL2-episode 2, Team Fortress 2 and introducing Portal; amazing! And then in small print; also includes HL2 and Episode 1, even more amazing! The colour orange will be forever Half Life, and the Dutch! Well I played quake 2 first but felt unsatisfied I needed a better game. forever be imprinted in my brain. It was a very exciting, scary and a little stressful moment. that pesky bad surface error I get bec. my pc then was so slow. As the sayin goes here…finishing hl1 is just the beginning…TOTALY TRUE…comes gazillion sp maps and mods. CS1.6…= bots….tnx to it I don’t need to go online or go to smelly near by lan parties to play it. CS or hl1 in general still has the greatest bots ever made. So whenever I hear CS it just reminds me these great bots it has. Well as well those de_dust haters at cs mapping forum coz I made the very first mirror/inversion of it called DE_TOOL. DOD was the mod the felt so sweet. I followed it since day 1 and that time it’s the only game set in ww2. DOD = forum and devs….it’s where I learn how to use forum haha! Very friendly devs though totally help me to all my dod beta problems. HL2…got a better faster pc but I was a little busy on work I had to go home early and avoid partying to have enough time to play it…so no real snap shot except probably those long rides with the vehicles enjoying the views and the source engine is always the first thing I remember about hl2. I’ll be playing it again FINALLY but using my smod custom weapons I’ve been modding/scripting the past weeks…wanna replay it with the coolest weaponry in the planet with IRON SIGHTS oh so very important for me nowadays, hehe…I’m done on using crosshairs. So hl2 with smod is probably my next snap shot of it soon. Then, nothing until the preview of “Day One”, which was exciting. Grim Fandango (one of the greatest video games ever made, sadly his mixed sales sealed the downfall of Lucas Arts adventure). SiN (the great FPS who suffered the malediction of being released at the same time as HL1…). How could I forget such a wonderful time?? -Far Cry designed as the “HL2 Killer” (it could have been it… seriously!). My first memory of Half-Life outside the actual game, was of looking at the full-page magazine ads (like this one!! 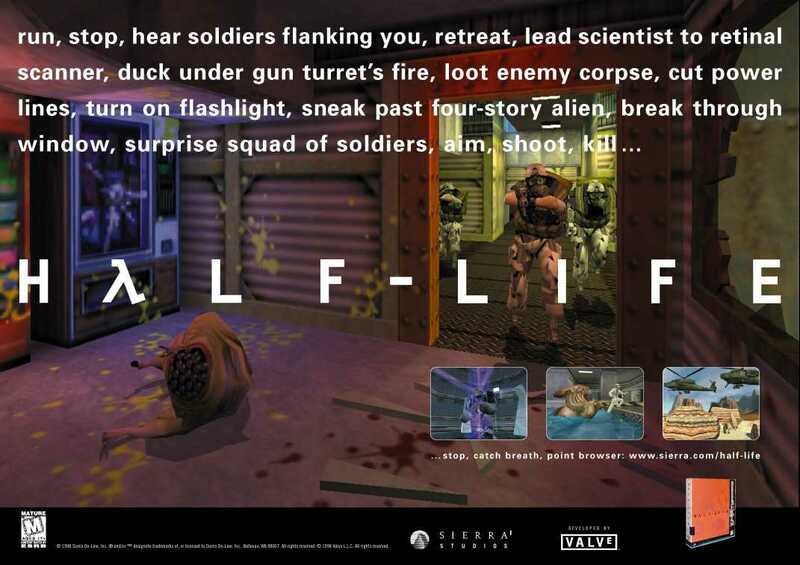 http://images4.wikia.nocookie.net/__cb20110306221850/half-life/en/images/9/9b/HL_ad_page_2_and_3.jpg ). I was highly intrigued at the age of 11. My first impressionable memory inside the game was of being amazed when I shot the scientist at the end of the Hazard Course and having all of the security guards return fire quite suddenly!! My first memory of Half-Life 2 outside the actual game, was of reading articles in gaming magazines that talked about the insane levels of detail that enabled the rendering of individual motes of dust in sunlight (we now know of them as a simple func_dustmote brush). My first impressionable memory of Half-Life 2 in-game was of G-Man’s face in extremely high close-up detail. Another highly impressionable memory for me was opening the doors to see the Citadel for the first time. Honestly, everything about Half-Life 2 is more grandiose and imprinting than what came before it. I can only imagine the extremes Valve are planning to go to with the next installment of the series. Yeah I was at my classroom in highschool when my best friend salvatore told me about it, I looked at him exceptical because he told me it was the best fps of all times! !, but then when he lend me it’s retail HL1 and played it I knew why he told me that, I definietely agreed HL changed my life in that little way, and if it wasn’t the best fps of all times, probably I wouldn’t be here playing mods all the time. My first memory of the half life games is when I was very young, like around six or seven not long after HL1 was released. My brother was like “Wanna see a cool game?” and I was like “Sure!”. So we went up to his room and he showed me a few minutes of HL1. It wasn’t much, all I remember was him walking through a very ominous looking door. Then he no-clipped through some glass and killed a scientist with a crowbar, and I recalled the scientist gibbing to pieces. Right after, my parents called me and I had to go. I believe my impression at the time was that it was a terribly realistic game (I was still playing Super Nintendo at the time believe it or not) and it had this really frighteningly serious air to it. I didn’t play any of the gold source engine games myself until around 2002, when I began playing CS 1.4 (or some version). Didn’t play the HL series until around 2004. Even then, I started with Opposing forces, then moved onto Blue Shift, then played HL1. Then Hl2 came out. I played the demo, and nearly died from all the realism and endless possibilities. My flashbulb memories of Half-Life are those from actually playing the game and its mods (particularly TFC) for the first time. I never paid much attention to the hype before release. But things like the tram ride (especially the music), the headcrab elevator, the dam, the cliff, the fade from black to see Xen – those are what stand out in my memory. I have a lot of great memories about games. For me, Half-Life series are just ones of many games that I enjoy playing. But, since you ask only about Half-Life related memories, I’ll keep to them. When I played HL1 for the first time, I liked how it contained a lot of different environments, a lot of gameplay situations. I thought that Half-Life’s abilities are limitless. I enjoyed Half-Life 2 a lot when playing it for the first time. Its photorealistic graphics were very atmospheric and immersive, even though I played it with a video card that didn’t support shaders. One day, I’ve got the game You Are Empty, and decided to read the review before playing it. The ag.ru review criticised the game, giving it 38 out of 100, so I prepared for a bad game, but was pleasantly surprised, because it turned out to be as atmospheric and immersive as Half-Life 2, with the same photorealistic graphics, and I don’t know any other game which managed to get as close to Half-Life 2, as this one. It’s not about your memories of the game itself, but more about when you first heard about it. Actually it was a very odd way to find out about it. My Dad had just married his 2nd wife(his first one/my mom had died a couple years earlier) and we had moved a lot of her stuff over including her PC, her computer desk, and the various boxes stuffed inside it. One day I decided to start digging around in it, and boom! Found a box called “Half-Life Platinum Collection”, but I’m telling this out of order. First I found a article in Game Informer interviewing either a Gearbox employe or a Valve employe, and all in the background was a backdrop of HL1(the cliff area, and the sand area), needless to say I read the article and got super excited about the game, really wanting to play it and then well I already told how I found the box with the game inside it. Needless to say a couple weeks after the box got found(after I had asked my Step-mom if I could have it) I was playing it on my Grandparents PC, and loving it. I don’t recall for any flashing memories from Half-Life 2 and it’s episodes. No reasons need to be given. The very first time I was introduced with Half-Life was when a friend of mine got this new game. We knew nothing about it so we played it. We finished it the same night, but it was an amazing game. It only felt incredibly short. Once I got the game myself I realized we played through the Half-Life Uplink demo. So what I experienced after that was sheer brilliance. Half-Life 2 was a whole different experience. It was vastly different from Half-Life yet still very familiar. I really enjoyed it although I kept hoping we’d return to black mesa. When I got to the point of entering Black Mesa East I was thrilled, only to find out it was just a small complex and not the real deal. Of course the game was still amazing and I enjoyed it to the fullest. I think I played through the game at least 4 times since then. I feel like revisiting it again very soon and play through the episodes as well. Anyway yeah that was my experience in a nut shell. amazing games to this day still. 2) The player has just taken out an airship or similar and combine come streaming from a recently opened doorway – only to find the player standing with an RPG and an endless supply of missiles – what fun! I’m sure there are many more favourites – any offerings?